Author and scholar Ellen Dissanayake has taken a unique interdisciplinary approach to exploring the origins and meaning of human art-making. She speaks with MOCRA director Terrence Dempsey, SJ, about her distinctive point of view, as well as the implications of her research for assessing and understanding contemporary art. Be sure to listen to the Audio Extras, "Where Do Book Covers Come From?" and "Every Mother's Child, an Artist." Audio Extra: Where Do Book Covers Come From? Ellen Dissanayake is a gifted scholar and lecturer residing in Seattle. She approaches art through the disciplines of evolution and ethology (the biological study of animal and human behavior), and makes a case for art being necessary for the biological survival of the human race. Her publications include three books and numerous articles. In 1988 her critically acclaimed first book, What is Art For, drew the attention of both the scientific and art worlds with its exploration of the impulse to make art, which Dissanayake calls “making special.” That book was followed in 1992 by Homo Aestheticus: Where Art Comes from and Why, and in 2000 by Art and Intimacy: How the Arts Began. Dissanayake has lectured widely in Europe, Australia, and North America. In 2013, the Maryland Institute College of Art (MICA) in Baltimore awarded her an Honorary Doctorate of Humane Letters. On April 15, 1999, Dissanayake gave a talk at MOCRA titled, "In the Beginning, Art." It was given in conjunction with an exhibition of contemporary illuminated manuscripts by artist Bernard Maisner. Learn more about the talk, and about the exhibition. "This book offers a new and unprecedentedly comprehensive theory of the evolutionary significance of art. Art, meaning not only visual art, but music, poetic language, dance, and performance, is for the first time regarded from a biobehavioral or ethical viewpoint. It is shown to be a biological necessity in human existence and fundamental characteristic of the human species. "In this provocative study, Ellen Dissanayake examines art along with play and ritual as human behaviors that "make special," and proposes that making special is an inherited tendency as intrinsic to the human species as speech and toolmaking. She claims that the arts evolved as means of making socially important activities memorable and pleasurable, and thus have been essential to human survival." Read more about the book on the University of Washington Press website. Find a copy near you on WorldCat. See the Audio Extra, "Where Do Book Covers Come From?" below, for more information about the Paul Gauguin painting that graces the cover of the book. A dictionary will tell you that ethology is "the scientific and objective study of animal behavior, usually with a focus on behavior under natural conditions, and viewing behavior as an evolutionarily adaptive trait." However, as Dissanayake indicates, it is a field of study with wide-ranging applications. Read more about ethology in this Wikipedia entry. See the Audio Extra "Where Do Book Covers Come From?" below for more information about the Gauguin painting Where Do We Come From? What Are We? Where Are We Going? Broadly speaking, petroglyphs are images or symbols that are marked into a rock surface through carving, incising or other means. They are distinguished from petrographs, which are drawn or painted onto the surface of a rock. Petroglyphs are found worldwide and can date back tens of thousands of years. See numerous examples in this Wikipedia article. More specifically, cupules are defined as "a hemispherical petroglyph, created by percussion, existing on a horizontal or vertical surface." Learn more in this Encyclopedia of Art article, or in this article by Robert Bednarik. Examples of cupules dating to c. 7,000 BCE. Source: www.visual-arts-cork.com. Painting of bison from the Cave of Altamira. Source: Wikimedia Commons. Prehistoric cave paintings can be found in locations around the world. There is scientific debate over which site is the oldest, but a leading contender is the Chauvet-Pont-d'Arc Cave in southern France. Other well-known sites include the Lascaux Cave, also in France, and the Cave of Altamira in northern Spain. Find a list of cave sites in this Wikipedia article. The Chauvet caves have received much attention. Immerse yourself in a panoramic virtual visit to the caves here (the website is in French). In order to preserve them from deterioration, a replica cave has been constructed and should be open to the public beginning in early 2015. Read about the replica cave in this article from Smithsonian Magazine. Film director Werner Herzog was able to gain unprecedented access to the cave, resulting in a stunning 2010 film titled Cave of Forgotten Dreams. Learn about the film and see the trailer here. There are also many videos on YouTube and other sites about cave paintings. The hormone oxytocin has been linked to roles in social recognition, pair bonding, anxiety, maternal behavior, and more. Read more about oxytocin in this article from the American Psychological Association website. The Society of Jesus, a.k.a. the Jesuits, is an order of Roman Catholic priests and brothers founded by St. Ignatius of Loyola in the sixteenth century. Jesuits undertake a long period of study and spiritual and ministerial formation, during one stage of which they are referred to as "scholastics." Learn more about the process of Jesuit formation in this article from America magazine. Christ of St. John of the Cross is a 1951 painting by Spanish artist Salvador Dalí (1904-89) now in the collection of the Kelvingrove Art Gallery and Museum in Glasgow, Scotland. One of Dalí's most recognizable and celebrated works, its unusual composition is based on a drawing by the 16th-century Spanish friar and mystic John of the Cross. Learn more about the painting here. Learn more about Dalí at the Dalí Foundation website. 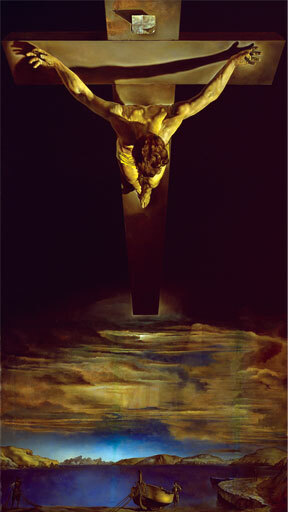 Salvador Dalí, Christ of St. John of the Cross, 1951. Collection of the Kelvingrove Art Gallery and Museum. art produced by self-taught individuals, usually without formal training, whose works arise from an innate personal vision that revels foremost in the creative act itself. Visit the AVAM website here. Jean Rouch (1917-2004) was a French filmmaker and anthropologist considered to be one of the founders of cinéma-vérité in France. He filmed in various regions in Africa for over sixty years. radically transformed nonfiction cinema and anthropology. His more than 100 films shattered any quaint notions of objectivity or unmediated, singular truth, irrespective of whether his subjects were the cultures, ceremonies, rituals, attitudes, music, and magic-making of the Songhay tribe of the upper Niger or those of his fellow Parisians. Even today, Rouch's films remain provocative and controversial in their interrogations of racism, colonialism, self-portraiture, the imaginary and the unreal, improvisation, the aura of the camera (what he called the "ciné-trance"), and the condition of observing and being observed. 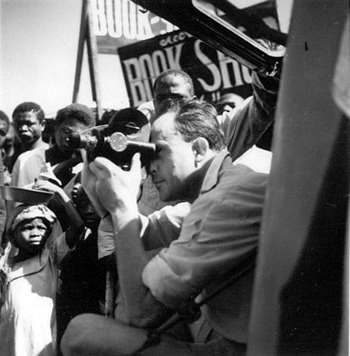 Learn more about Jean Rouch on this tribute website. One of the African peoples Rouch documented in his films were the Dogon , an ethnic group living in the central plateau region of Mali, in Western Africa. The Dogon are best known for their religious traditions, particularly as expressed in elaborate masks used in ritual dances, wooden sculpture, and architecture. Learn more about the Dogon in this Wikipedia article, or watch this video on the art of the Dogon from the Metropolitan Museum of Art. Port Moresby is the capital and largest city of Papua New Guinea (PNG), an island nation in Oceania north of Australia. The Sepik River is the longest river on the island of New Guinea. Head for Yam Ceremony (Yena), 19th-early 20th century, Yasyin-Mayo people, Yau village, Washkuk Hills, Upper Sepik region, Papua New Guinea. Collection of the Metropolitan Museum of Art. "The Kwoma, Nukuma, and Yasyin-Mayo peoples of the Waskuk Hills region north of the Upper Sepik River in New Guinea share a distinctive artistic tradition centered on an annual sequence of ceremonies devoted to the cultivation of yams. A supernaturally powerful food, yams cannot be eaten until the spirits (sikilowas) responsible for their growth and, more generally, for the welfare of the community have been appropriately honored. ... Each ceremony requires the creation of a specific type of figure. Carved wood heads such as this one are created ... When in use, the boldly painted heads are further embellished with brightly colored leaves, feathers, and other ornaments." Learn more on the Met website. The 1974 exhibition African Art and Motion was presented at the National Gallery in Washington, DC. Read a summary of the exhibition here. Or, find a copy of the exhibition catalogue near you on WorldCat. The exhibition Currents 109: Nick Cave , featuring Cave's "Soundsuits" sculptures, was presented at the Saint Louis Art Museum from October 31, 2014 to March 8, 2015. Read the exhibition press release. The 1969 painting Three Studies of Lucian Freud by Irish painter Francis Bacon (1909-92) sold at auction in November 2013 for $142.4 million. Learn more about the painting in this Wikipedia article. Also in November 2013, the stainless steel sculpture Balloon Dog (Orange) by Jeff Koons (b. 1955), dated 1994-2000, sold at auction at Christies for $58.4 million. See the auction listing here. Artist Craig Antrim creates abstract paintings informed by philosophy, Jungian psychology, Joseph Campbell and art history. His work was included in the acclaimed 1986 show, The Spiritual in Art Abstract Painting 1890 - 1985, held at the Los Angeles County Museum of Art (see below at 41:25). Antrim's work is included in the MOCRA collection and has been featured in a number of MOCRA exhibitions. Learn more about Antrim here. Fr. Dempsey refes to a number of exhibitions. Images of the Unknown was displayed at PS1 in New York from April 13 to June 15, 1986. Find a list of artists in the exhibition in MOMA's PS1 archives. The exhibition Sacred Spaces was presented at the Everson Museum of Art in Syracuse from January 22 to March 23, 1987. Find a copy of the exhibition catalogue near you on WorldCat. Other Gods: Containers of Belief was organized by Fondo del Sol Visual Art and Media Center in Washington, D.C., in 1986. Read a review in the The New York Times. The landmark exhibition The Spiritual in Art: Abstract Painting 1890-1985 was shown at the Los Angeles County Museum of Art (LACMA) from November 23, 1986, to March 8, 1987. Read a review of the exhibition in The Criterion. Find a copy of the exhibition catalogue near you on WorldCat. Audio Extra: Where Do Books Come From? Paul Gauguin, Where Do We Come From? What Are We? Where Are We Going? 1897-98. Collection of the Museum of Fine Arts, Boston. French Post-Impressionist artist Paul Gaugin (1848-1903) considered the painting Where Do We Come From? What Are We? Where Are We Going? to be his masterpiece. Learn more about the painting on the Museum of Fine Arts, Boston, website. The title is inscribed in the upper left of the painting, in French: "D'ou Venons Nous / Que Sommes Nous / Où Allons Nous." Read more about evolutionary adaptations and human childbirth in this 2003 article from Scientific American. After the collapse of the Soviet Union, families from the United States and other Western countries began adopting children who had been raised in orphanages in Eastern bloc countries such as Romania and Russia (in 1989, there were were more than 100,000 children in Romanian government institutions). It soon became apparent that these children had significant behavioral and developmental challenges, and a number of researchers began studying the causes and effects of these problems. Listen to a 2014 report from National Public Radio on the findings from this research and the experiences of the children, both while in the orphanages and after adoption.